Here’s what’s up in the world of television for Thursday, June 26. All times are Eastern. 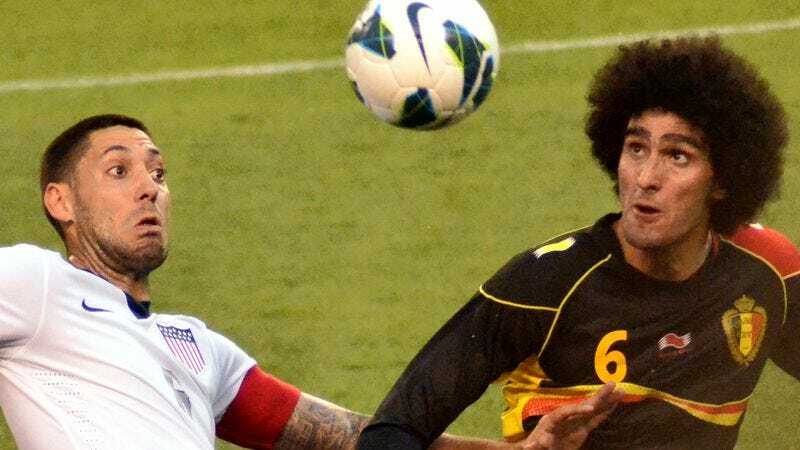 World Cup: Group G, Portugal vs. Ghana (noon, ESPN2): The other game. See above for hyper-ventilating. Hey Bartender (Showtime, 8:25 p.m.): A Showtime original documentary on the currently hip craft of tending bar, following two bartenders at the top of their game and touring “exclusive” bars in New York City. Monty Python’s Flying Circus (1 p.m.): What would a flying circus look like, anyway? We once saw a bit on Looney Tunes about a flea circus. That we may have imagined. But there were fleas, who were married, and kept reproducing. Zack Handlen wishes we would focus on the matter at hand. Friday Night Lights (3 p.m.): It’s the Mud Bowl! Sonia Saraiya enjoys neither mud nor bowls all that much, but a Mud Bowl is right up her alley. And in the penultimate Tournament Of Episodes decision, Todd VanDerWerff has to choose between The Good Wife’s “Hitting The Fan” and Mad Men’s “The Strategy.” Uneasy is the head on which rests the crown. The American Bible Challenge (GSN, 8 p.m.): Week seven. NY Med (ABC, 10 p.m.): Season two of this real-life medical drama starts tonight. The premiere focuses on Dr. Mehmet Oz, “America’s most famous doctor,” who is in the right place at the right time to save a young actor at New York Presbyterian Hospital. Kate Plus 8 (TLC, 10 p.m.): Either this is airing again or some second installment of it is airing. Whichever it is… INSTA-DVR. World Cup: Group H, Korea vs. Belgium (ESPN, 4 p.m.): Oh, poor Group H, you are the least interesting, especially compared to the shenanigans of Group G. Belgium, with six points, is practically guaranteed to advance; Algeria is second, with three points. Korea and Russia are just happy to be there, with one point apiece. World Cup: Group H, Algeria vs. Russia (ESPN2, 4 p.m.): But as Stephen Colbert so elegantly explained above, anything can happen in soccering. So You Think You Can Dance: Did you know that we review this show sometimes? Because we didn’t. So You Think You Can Review So You Think You Can Dance? So You Think You’re What’s On Tonight? So You Think You Know A TV Section And Then It Turns Out You Don’t? So You Think Oliver Sava Is Trying To Get Rid of You?